Do you have a Streamtek Corp Air Conveyer? If not, you should consider getting one! Its a powerful product that turns any ordinary hose or pipe into a powerful conveying system for trim, parts, scrap, and other bulk material transfer. The Air Conveyer has no moving parts, requires no electricity, and needs no maintenance. It has a longer life than traditional blower systems and provides an instantaneous response with no downtime. There is no explosion hazard and allows for simple and easy control of flow material. It comes in two different models: threaded and non-threaded. The threaded type can be attached using any standard plumbing couplers, whereas the non-threaded can be affixed to a standard hose/tube using a clamp. The six standard sizes available range from 1”-3”, and come in both aluminum and stainless steel. There is also a high temperature 316 stainless steel option. The standard kit includes an auto drain filter with a 5 micron filter which is properly sized to avoid airflow restriction. You can purchase the threaded and non-threaded air conveyer in three packages. The unit can be purchased on its own. The Standard package includes the conveyer and the air filter. The Deluxe package includes the conveyer, filter, and a pressure regulator with a gauge. The type of model you need will depend a lot on what you would like to convey. If you are unsure about which package to purchase, contact Streamtek Corp using the contact information at the end of this article. The Air Conveyer amplifies the air 9 times over! 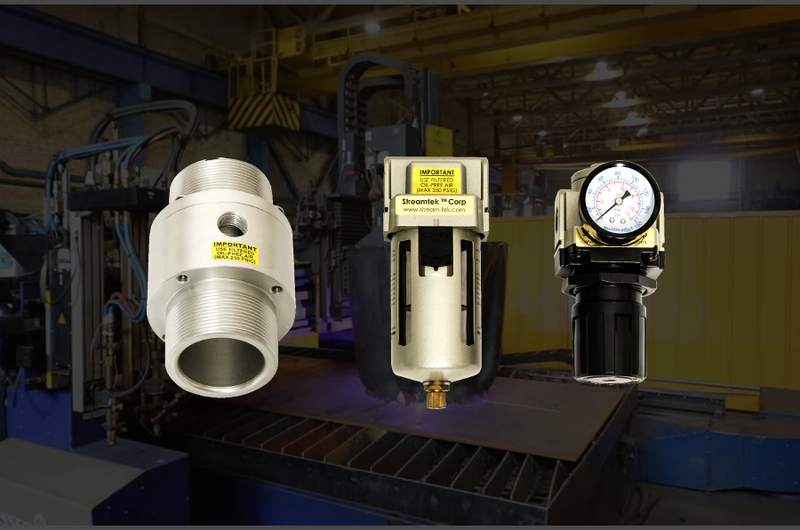 It works by taking in compressed air through an NPTF inlet and into a plenum chamber. The air is then injected through directed nozzles, which creates a strong vacuum at the intake. That vacuum draws material in and accelerates it through the unit. This makes the Air Conveyer a powerful product to meet your conveying needs. There are so many more items you can move with an Air Conveyer! Like every Streamtek Corp product, the Air Conveyer is stringently tested and well-crafted. We also like to make sure our customers understand our products and how they can be used. If you’re unsure about how an Air Conveyer can be used in your factory, call our Application Engineers at 1-705-770-4455 or email our support at support@stream-tek.com. Compressed air is your most expensive utility!